NOTE (8/7/2018): I've edited this post, originally written/published 5/5/2011, to omit the no longer relevant back story and broken links. I had referred to a discussion on Jimmy Moore's now-long-defunct LLVLC Discussion Board that made me aware of the Eades' post discussed. SUMMARY: Fat in the blood following a fatty meal is almost entirely due to the fat in the meal. Several years ago, Dr. Michael Eades wrote the following post: ABC’s big meal propaganda. Sadly, the video is no longer available. It involved subjects consuming a GIGANTIC meal of 6000 calories, after which blood was drawn two hours later. This "after" blood was very cloudy, and the technician holds this up and identifies the source of the cloudiness as fat. The meal was deep fat fried mac&cheese, a bacon cheese burger quesadilla and fries and an ice cream smothered giant cookie. Yes, high in fat and carbs, but favoring the starches. While they pointed finger at just the saturated fat -- it was 187g of saturated fat == it's not too much of a stretch to estimate this meal contained around 300-350g total fat or more. I'm not sure when the last time cheese contained no saturated fat was, and he used livestrong.com data, but something wouldn't have sounded quite right to me. According to Cheesecake Factory it's even a bit more convoluted because they list around 1500 calories, 63g fat (again no sat fat) but only 77g carb and no protein. Again, I'm not sure what kind of cheese this is at the CHEESEcake factory ;-) Seems to me the carbs are rather overstated and the fat slightly understated and the sat fat not properly reported. Eades also chides the researchers for "stretching the truth" a little on the serving size of the cookie - it's supposed to be shared by 4 people. Well, I would note that CF lists a 1500 cal portion of the M&C as serving 2-4. But in the end, folks, this is an example of true picking at fairly irrelevant minutia. It was a huge fatty, carby, calorie-laced meal. Even most VHF low carbers wouldn't come close to 258g fat for a day let alone a meal!! I find this rather startling. Or maybe doctors don't even have a good idea of what blood samples look like and never have an opportunity to see a variety of such from various sources? 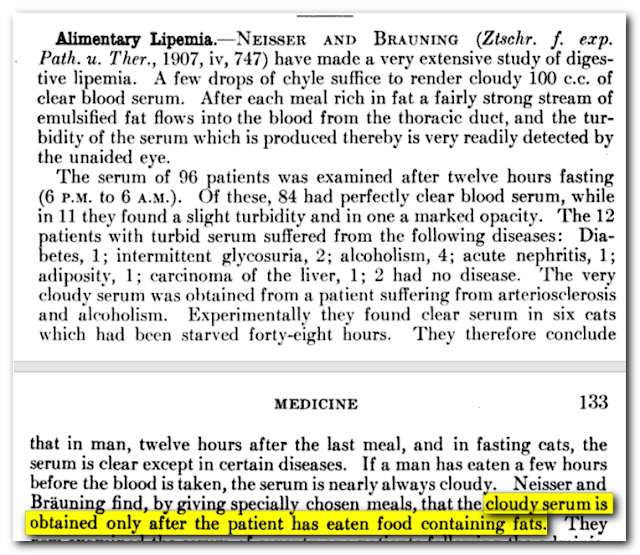 I have worked with literally thousands of blood samples in my former careers and it's really *common knowledge* that cloudy blood results from a fatty meal. From the fat in that meal. It's doubtful they could have consumed a low fat high carb lunch approaching 6000 cals, but if they did, no, the blood would not look the same. I even dug up a citation though for those who might doubt this. The timeline is not given here, but 170g fat is about 2/3rds of the fat in the ABC test meal. Recovery of the ingested lipid tracer was evident in the CHYLO, VLDL, and fatty acid fractions 2 h after consumption of the meal in both men and women. Now, the meal consumed in the ABC "study" contained about 5X the fat as this study. By 2 hrs, as the demonstration showed quite clearly, the blood was swimming with fat. Fat from the meal. Yeah, NOW it's all too complicated, go read a study. The study is interesting but doesn't answer the question which was, essentially, how fast the liver could feasibly crank out triglycerides derived from de novo lipogenesis. It should have given anyone pause. How fast could the liver produce fat to cause that fatty plasma? That's the first thing that came to my mind after I got past my shock that a doctor would even suggest that the fat in the blood wasn't from the fat in the meal. But clearly most read what Eades said and presumed he knows what he's talking about. Except that he got his timeline wrong. And he apparently only looked at Davis' first linked post and not the second. Below is a screenshot of the results of one of Davis' reader's experiments that should have given Eades pause had he seen it. He never answered Vesna's inquiry. Repeated ingestion of a VLCD initially increases circulating TAG-rich chylomicrons, which are cleared rapidly by lipoprotein lipase (LPL) bound to the luminal surface of capillary endothelial cells in skeletal muscle and adipose tissue. Although speculative, we suggest that a VLCD increases muscle LPL, enhancing TAG clearance. A VLCD leads to lower glucose and insulin levels, which decrease LPL and increase hormone-sensitive lipase (HSL), promoting TAG hydrolysis and increasing fatty acid (FA) rate of appearance. LPL-mediated lipolysis of chylomicrons results in release of FA that is either taken up by the underlying tissue or escapes into the circulation. Any increase in FA delivery to skeletal muscle is balanced by an increase in fat oxidation as evident from the postabsorptive respiratory exchange ratios near 0.7. Circulating FAs are taken up by the liver and preferentially diverted away from esteriﬁcation to TAG and toward mitochondrial oxidation to acetyl CoA. Accumulation of acetyl CoA exceeding the capacity for mitochondrial oxidation results in the formation of ketones. Reduced hepatic production of TAG results in less VLDL synthesis and secretion into the circulation. No. What was sad about this is that Eades wrote this at all, though he should know the truth to be different. I read that and I think, who do I believe? Do I believe the studies that I have read, the texts I have read, and the doctors I have heard from, or do I believe Eades? As far as I'm concerned, there's no contest. The weight of the evidence that I have seen comes down on the side of him being wrong. And that just adds to my sense of not trusting him or anything he says (much like Taubes). This is another reason I'm glad I took him off my blog roll a LONG time ago. Do you actually have this text? "The American journal of the medical sciences, Volume 136"
Thanks Hans. Did you just change the name of your blog? I have that in pdf form. What is it you're interested in? Yea, I changed it. Glad you noticed. Nothing particular, just thought it would make an interesting read. I do think that ABC deserves a hand for advising us about the dangers of eating almost 6,200 calories of fast food in one sitting. That's the kind of hard-hitting investigative journalism that has made traditional news media so popular these days. I was thinking the same thing Tonus!